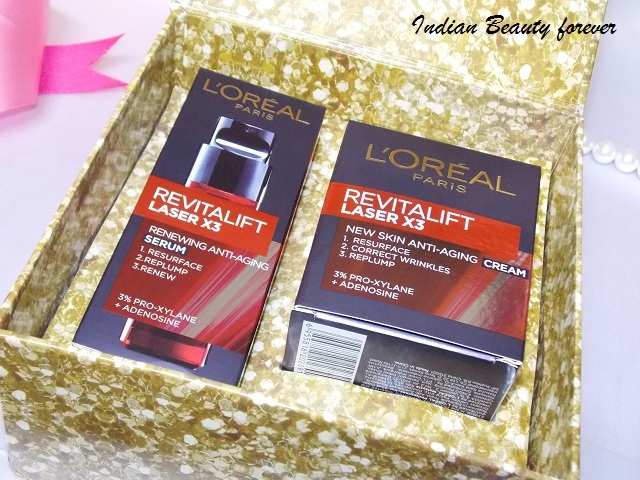 A couple of weeks ago, L'Oreal sent me these two anti aging products that they have recently launched in India. 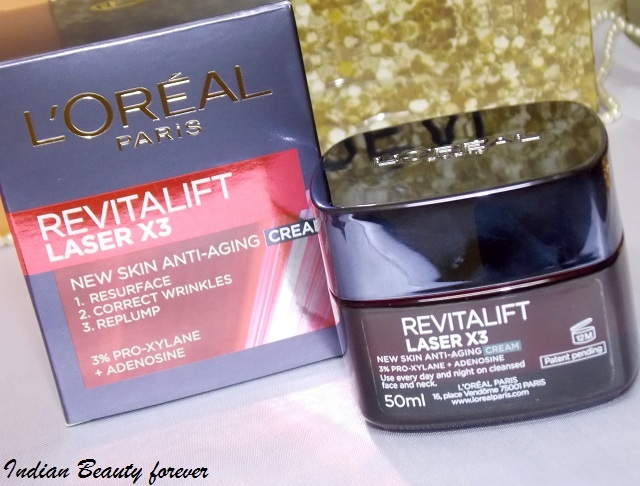 They are the first renewing anti aging products and the entire range has been named as L'Oreal Paris Revitalift Laser x3 that has been designed to improve the skin quality. The range consists of a cream, serum and an under eye cream. 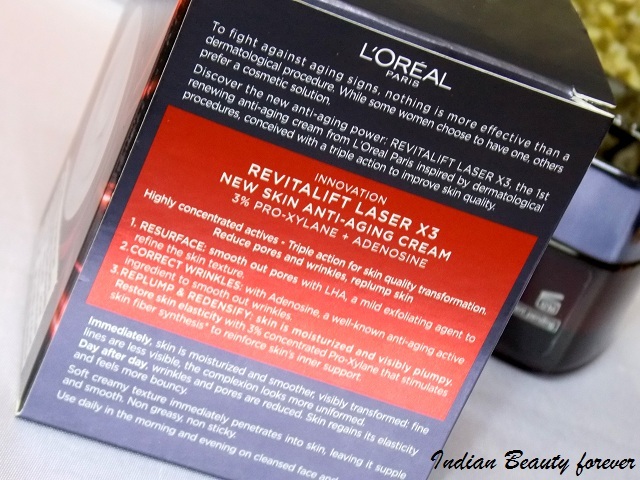 I will review L'Oreal Paris Revitalift Laser Renew Cream in this post. 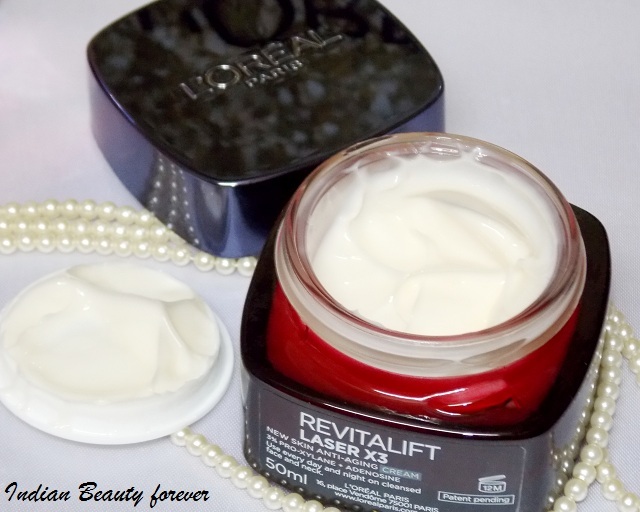 Experience: L'Oreal Paris Revitalift Laser Renew Cream comes in a heavy glass square jar that looks quite enticing with a blue black cap though I would have preferred a pump pack. The jar has a safety lid over the top to secure the cream. 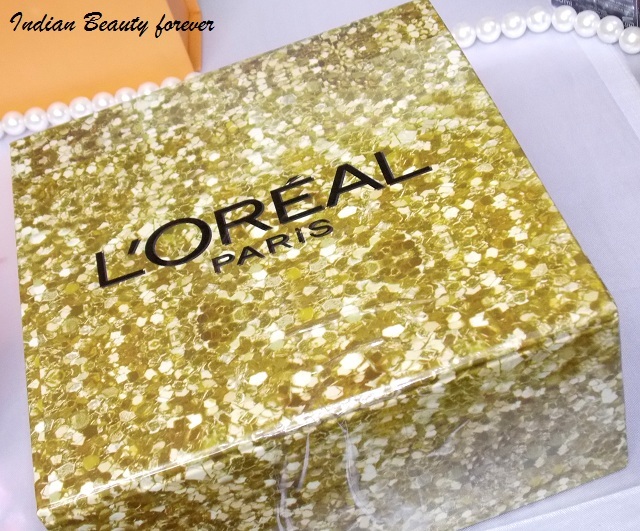 I will leave it to you to check out the other details of the packaging! The cream has a medium consistency with a very smooth texture. The formula is hydrating and nourishing, once it gets absorbed properly into the skin, which hardly takes 30 seconds. Skin looks well toned and no dryness at all. There is this subtle glow on the skin without looking greasy. Now, here I am talking about people who have normal to dry skin. For them it will not be greasy but those who already have oily combination skin like me, it can be very slightly heavy on the skin. This cream is supposed to be used both morning and evening. 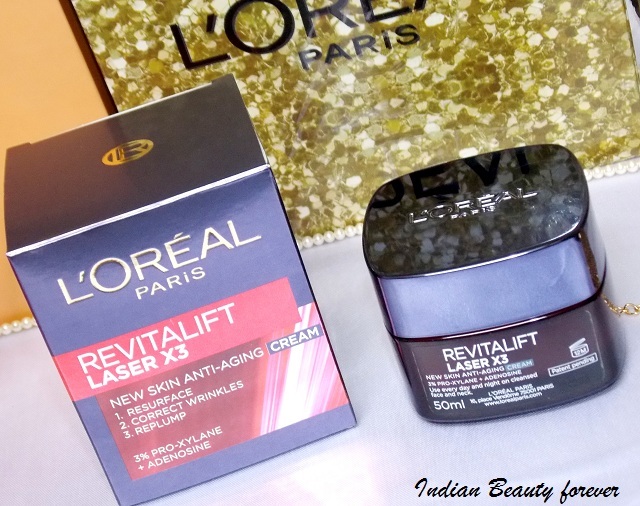 My mum is the one who is using this L'Oreal Paris revitalift cream. I am using the serum only while she uses both the serum first and then this cream. My mom has dry skin and this cream gives adequate moisture to her skin apart from the anti aging care. In anyways, when you age, skin tends to get drier due to which more wrinkles are formed or get deepen over the time. That is why hydration is her primary requirement which this cream provides her. After using it for more than three weeks she has noticed that her skin appears toned and glowy. She told me that while touching her face she can feel that skin is softer with no dry patches. She also noticed reduction in fine lines, this can be due to the fact that the cream makes the skin a bit plump resulting in lesser fine lines. But still she has not seen any major results or changes in the wrinkles. But whatever the cream has done, she is quite satisfied with that! So, that was for mature skin but if you are in your 30s or over 25 and wanting to start an anti aging skin care then you may consider it if you don’t mind the price. The tub contains 50 ml of the anti aging cream which would last for around a month and half if used twice a day in normal quantity. She has not faced any allergies or breakouts, or any other skin irritation while using this anti aging Cream. I use the serum only as I used the cream a couple of times but find it a little heavy for my oil skin though for dry skin it does full justice on the hydration aspect. I got both of these products in this beautiful pack!! 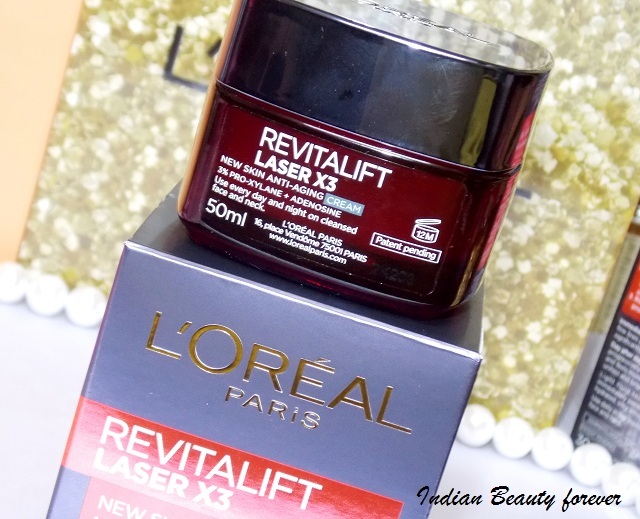 Take: L'Oreal Paris Revitalift Laser Renew Cream can be used day and night. 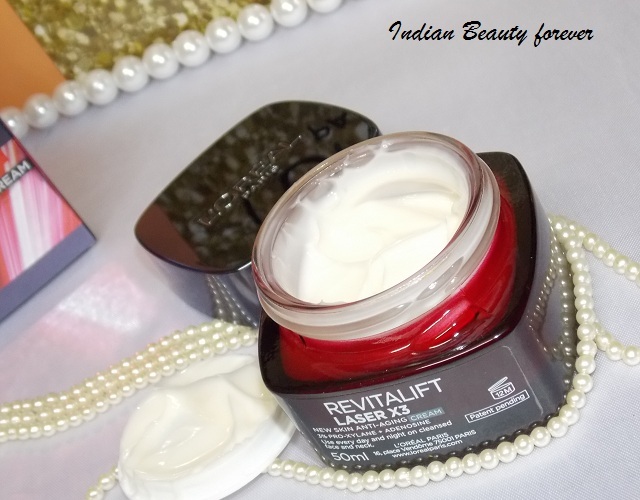 Its hydrating formula gives proper moisture to the dry skin, makes skin plump, radiant and smooth to touch. Fine lines are reduced though it may not work the same for wrinkles like crows feet, deep lines around the mouth etc. 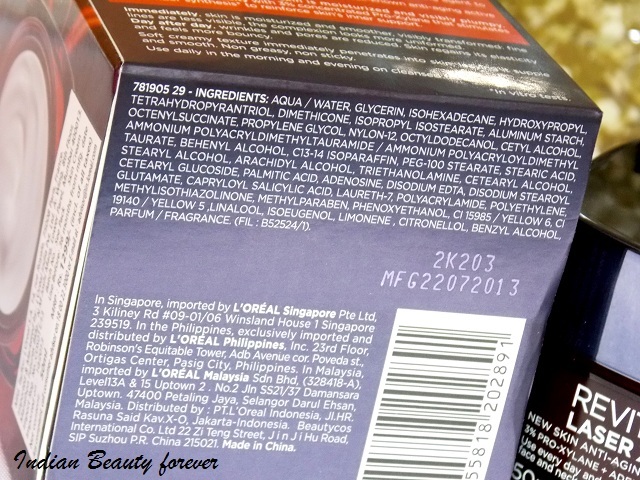 Good as a preventive measure for 25 plus people and as an anti aging measure for mature skin. PR sample though the review is honest as always!